And the weeks just keep flying by. That is definitely one thing that a busy life is good for! Between work, church stuff, baby prep, working out, keeping a clean house and washed hair, the days are zooming by. 33 Weeks. How did we get this far? Less than 7 weeks away... a month and a half... under 50 days. Next month. How many different ways can I say this to not make it feel so far away yet so close all at once? Things are starting to feel real. I can feel Baby N's movements getting stronger and I can tell he is getting much bigger. Watching my belly contort and move all over the place is now not only one of MY favorite activities, but my co-workers' as well. Usually around 9:30am every morning, a small crowd gathers around my cubicle to watch Baby N do his daily stretching and rolling routine. He doesn't disappoint. 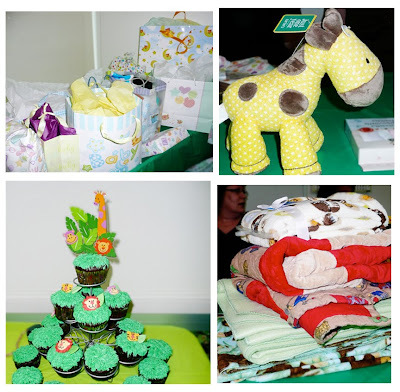 So, speaking of my co-workers, they did something amazing this week... they threw us a BABY SHOWER! This had been on my calendar since January, but it had always felt so far away. Well, yesterday was the big day and it was a BLAST! Sam was able to come (it was co-ed, w/ all my co-workers) and he actually had a really good time. He was a bit hesitant as showers are not known to be the most masculine of activities, but there were quite a few guys there and no cheesy baby games, so he did just fine. My co-workers really went all out. 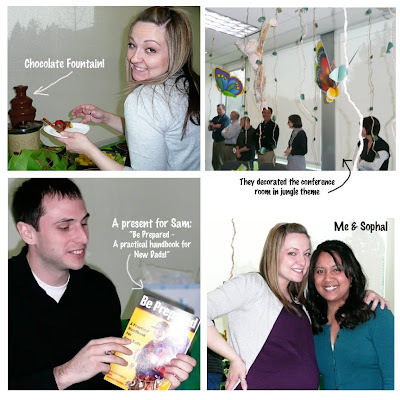 The room was decked out in a jungle theme (we're doin the nursery in jungle animals) and the food was amazing, complete with a chocolate fountain and jungle chocolate cupcakes! Everyone was super generous and Sam and I both were just floored with how thoughtful everyone was. We were given blankets, clothes, books, toys, giftcards, and words of advice. It was amazing... I cannot thank them all enough!! 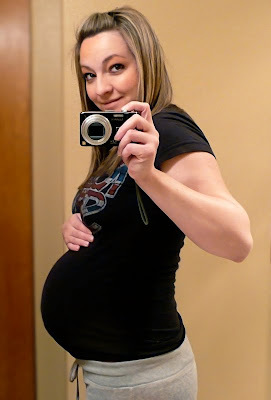 33 Week Update Another week down, another week closer to meeting Baby N! And one less week left to prepare myself and everything around me for his arrival. Gulp. Like I said, he's getting big. 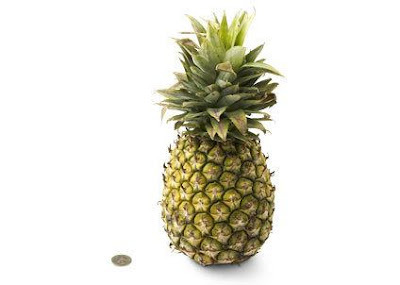 babycenter.com says he is similar to the size of a pineapple (but I'm not sure if this is with or without the spikey hair...?) Imagine giving birth to one of those... ouch. He could be a bit over 4 lbs. and 17" from head to toe. From here on out I'm supposed to gain a pound a week, and about half of that goes straight to Baby Boy. At least I can mark one thing off my to-do list... gain weight: check and check. And check. Hey! You are looking so good! We are super excited to come visit in 2 weeks! Laurel - Just sent you a FB message! Mom - It is getting close. And yet... so so far. Argh! How fun for you guys to have your first baby shower be co-ed so Sam could be there. I love it! Good job, co-workers!